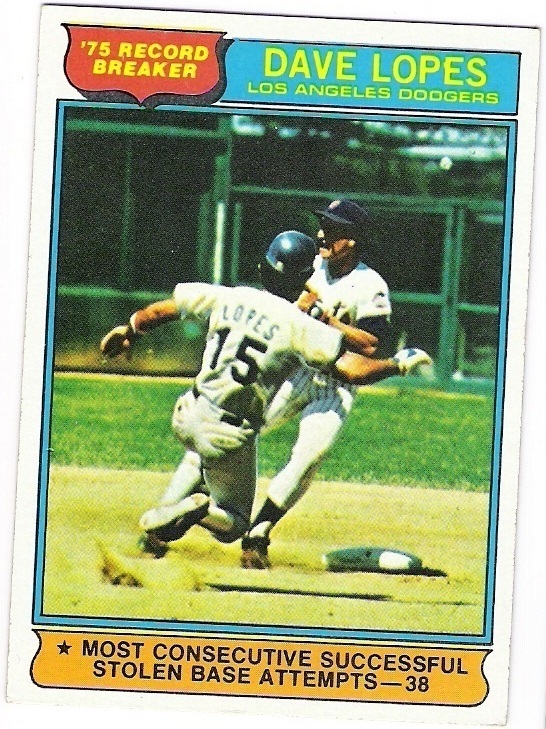 a baseball card celebration of the dodgers and the infield of my youth. a cavalcade of legends - one of which can be yours! hey there! 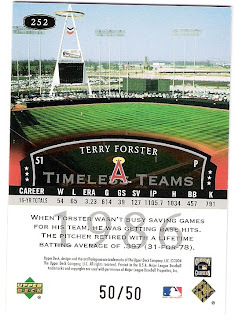 don't forget that in a couple of days i will launch my 'timeless teams' blog - a celebration and critique of upper deck's 2004 legends set, featuring 300 base cards, on-card autos, fold-out relics, numbered parallels and more. become a follower today! and, if you follow and/or hype the site on your blog between now and 1/8/12, you will be added to a drawing to win this steve yeager auto from the set. or maybe one just like it - i have 2 and am not sure which one i scanned. just be sure to become a follower and/or let me know about a link to the site in one of your blog posts on or before the 8th. if you do both, you will get two entries. just for fun, here are just a couple of the other dodger autos i have from the set, each of which will be featured at some point on the new blog. timeless teammates from the 1988 dodgers' timeless team! so - check out the site. it'll be better than a big tub of goo. 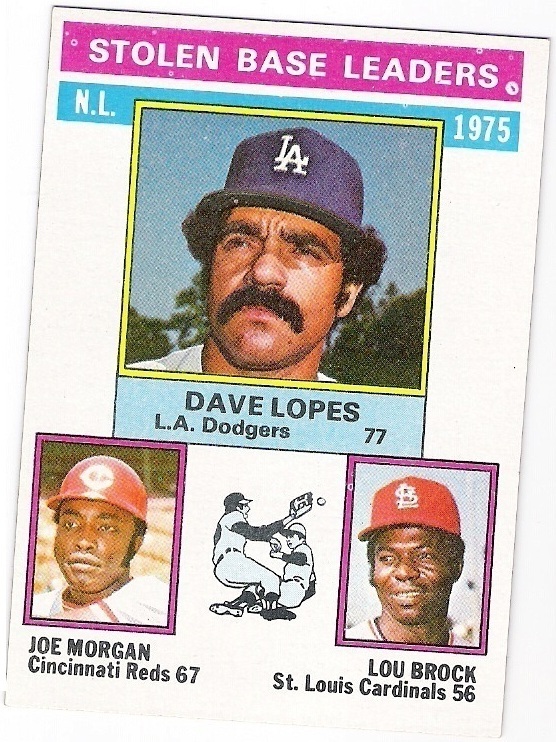 the 1978 topps dodgers who were, in fact, dodgers in 1976. at least according to topps. the dodgers did indeed 'get dusty baker from braves' as his 1976 topps traded card proclaims. 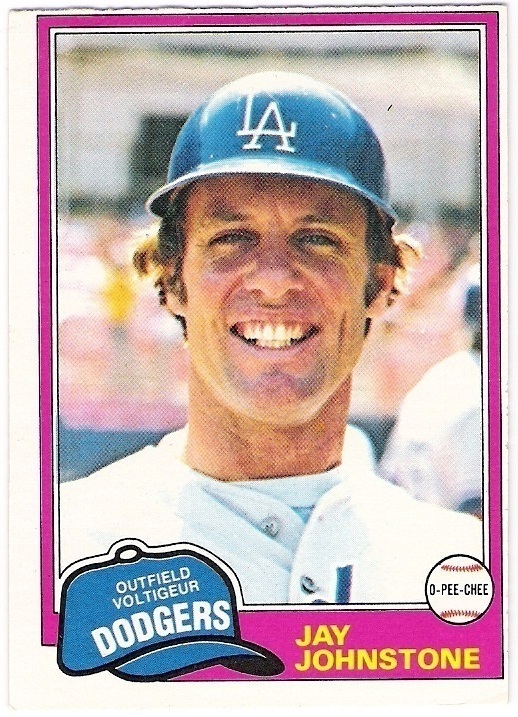 as i mentioned yesterday, dusty hit only four home runs in his debut season as a dodger, but he perservered and rebounded very nicely in 1977.
that is to say, the dodgers weren't in need of a new third baseman, nor were they interested in losing the one they had, despite the fact that topps used a hatless photo of cey on his 1976 card, with the team name conveniently obscured. cey hit only two fewer home runs in 1976 (23) than he had in 1975 (25), but his rbi total was down by 21. still, he made the all-star team again, although he lost the starting vote to pete rose. 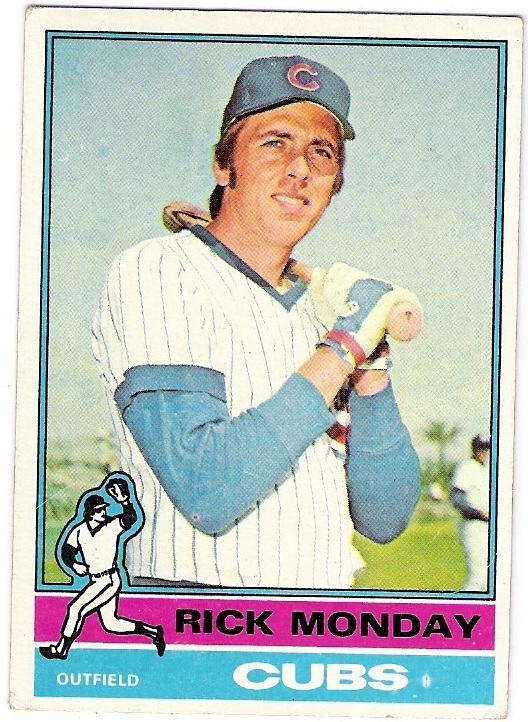 in fact, he tripled in the game's first run after rose led off the national league's first inning with a single. 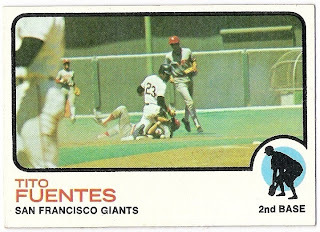 he then scored the winning run two batters later on a george foster groundout. like cey, garvey's power numbers were down in 1976 - even more significantly so. 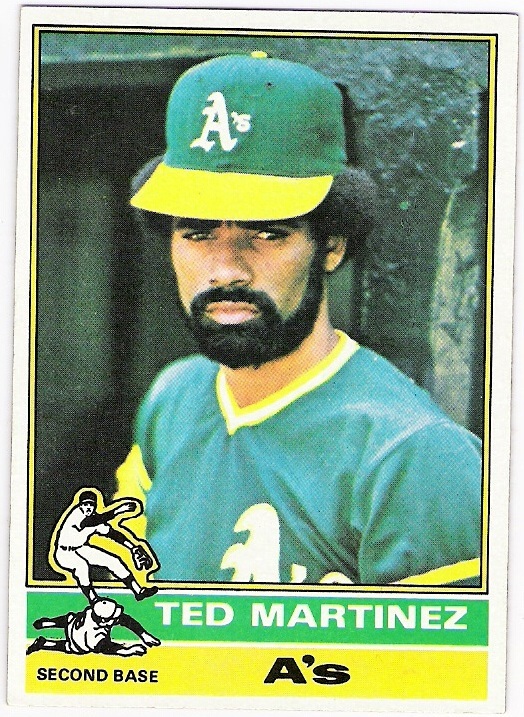 he managed just 13 home runs with 80 rbi. he still had 200 hits and hit .317, however, and finished 6th in the nl mvp vote. 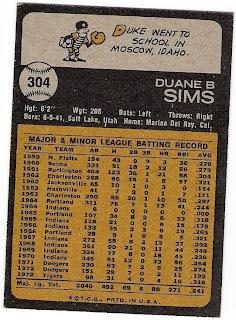 he also stole a career high 19 bases and continued his consecutive games played streak by playing in all 162 games. goodson was acquired from the braves in the dusty baker trade, but was airbrushed into a dodgers' hat in time for the flagship set's printing. 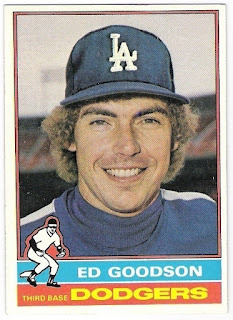 it's as if topps knew goodson wasn't going to play much first base as a dodger, as they show him as a third baseman even though he spent most of his playing time as a first baseman the previous two seasons. topps was right, though, as walter alston used goodson mostly as a third baseman. 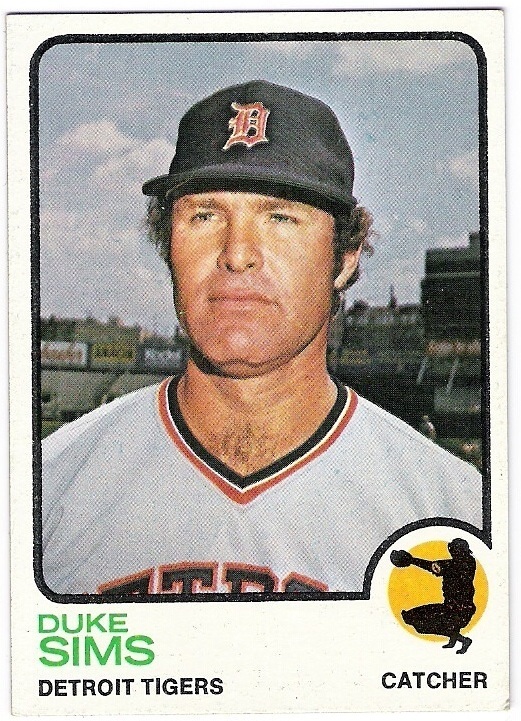 he made only 3 appearances at first base, along with 2 as an outfielder. 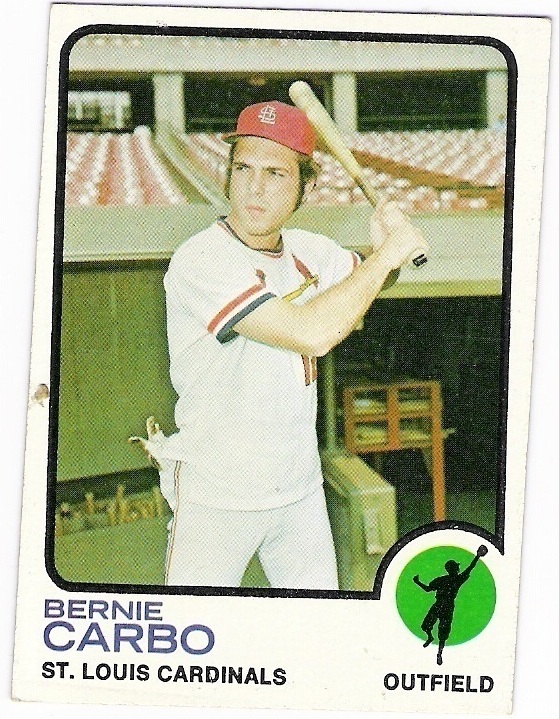 two of his three home runs hit in 1976 were as a pinch-hitter. 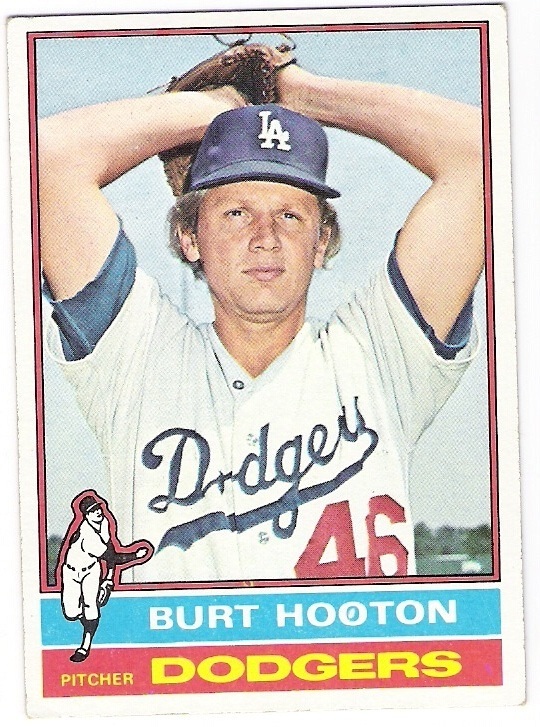 after winning 18 games for the dodgers following the trade from the cubs in early 1975, hooton went 11-15 in 1976. his era rose to 3.26 and his whip was up a tick to 1.16, but his record was more due to the fact that 8 of his losses came in games in which hooton allowed 3 earned runs or less. 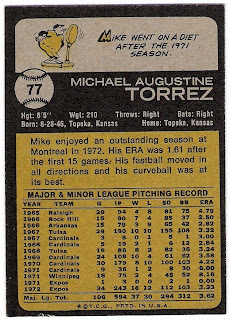 in total, he made 33 starts, and had 8 complete games with 4 shutouts, including a pair of two-hitters. he appeared in 77 games and had 18 saves to go along with his 12 wins. he also threw 9 wild pitches. hough averaged about 2 innings per appearance, and had 2 5.2-inning stints in 1976.
especially with dodger stadium as the backdrop for the photo. 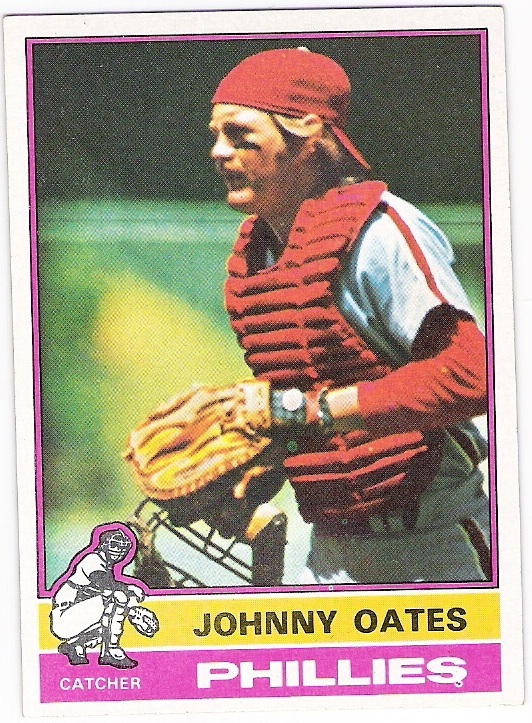 john had missed the entire 1975 season thanks to his ligament replacement surgery. 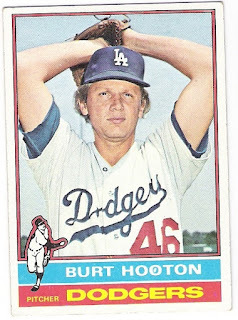 he came back in april of 1976, and wound up pitching 207 innings. 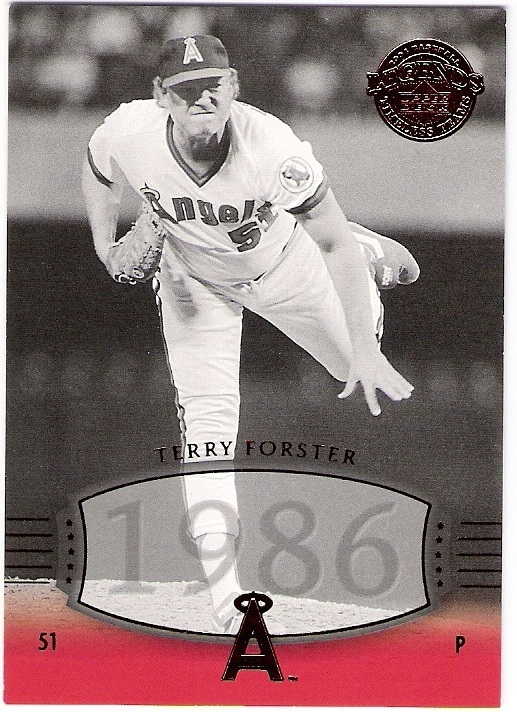 his record was 10-10, but he also posted a 3.09 era with 6 complete games and 2 shutouts. for his troubles, john was awared the 'hutch' award, given to the player who embodies the 'fighting spirit' of fred hutchinson. he also was named the national league's comeback player of the year. 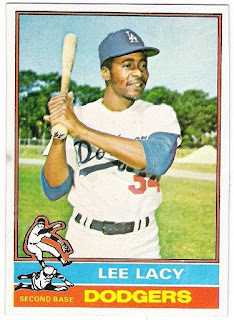 however, lacy was traded back to the dodgers during the 1976 season with elias sosa for dr. mike marshall. 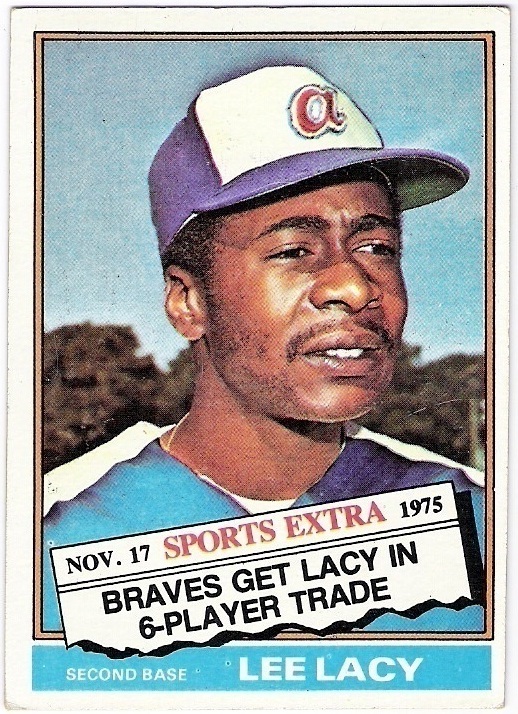 lacy's season was pretty evenly split between the two teams, as were his stats except that all three of his home runs were hit for the braves. 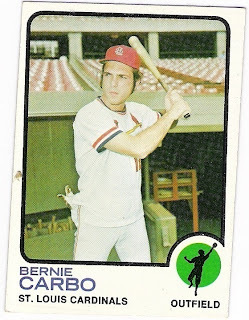 still, he led the league in stolen bases for the second straight year, guaranteeing him a second card in the 1977 set, so long as topps continued to make cards for league leaders. 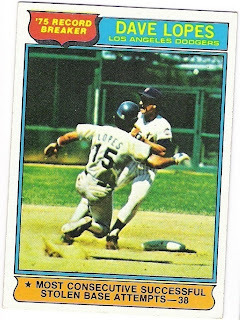 speaking of extra cards, lopes was given a record breaker card in the 1976 set thanks to his streak of successful stolen base attempts. at least topps had him turn his head for the photo. 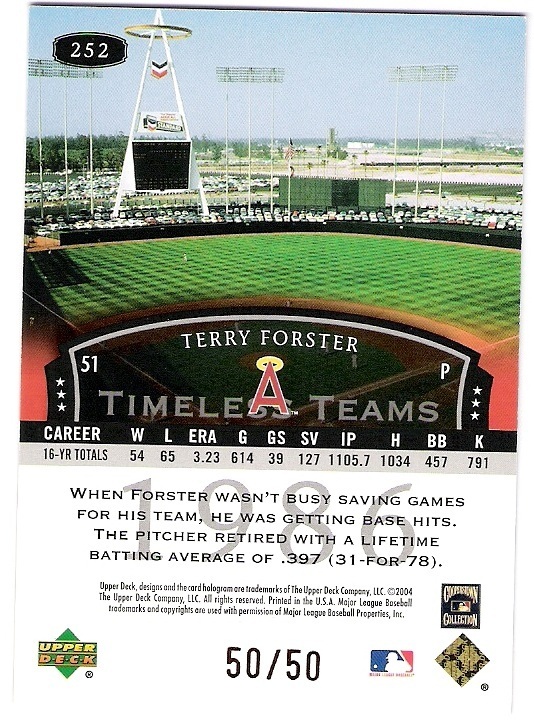 i like how they used the shortstop logo (with a ball) on the card. check out bill russell's card below to see what i mean. thanks to a dark photo and wrigley field as a backdrop. for the fourth year in a row, mota's playing time diminished. 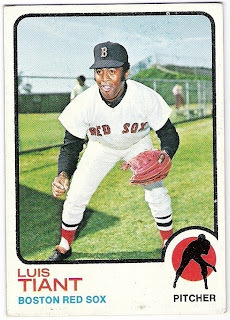 he appeared in 50 games in 1976, and played in the field in only 6 of them. 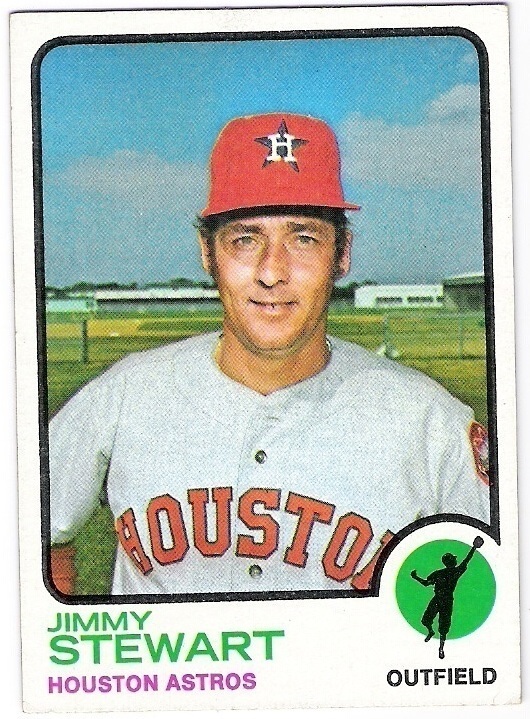 he hit an even .300 as a pinch-hitter (12 for 40 with 6 walks and a sacrifice fly). he won a career high 16 games and had a personal best 2.57 era in 32 starts. 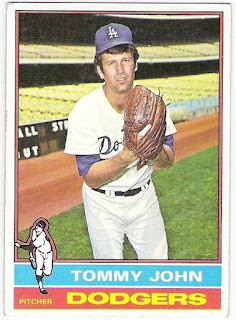 he threw 8 complete games and had 3 shutouts with a couple of 3-hitters. he deserved it, too, as he was 12-3 with a 2.98 era in 26 starts. 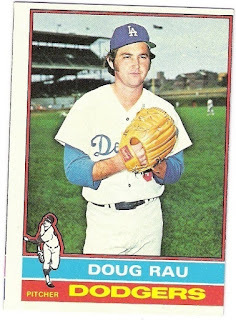 he had 10 complete games and 3 shutouts with two of those being 3-hitters like rau. 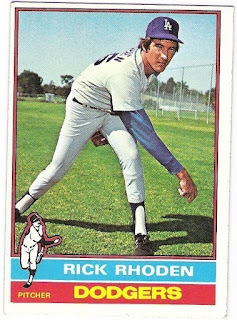 rhoden was named to the all-star team for the first time in his career, and pitched a scoreless inning in the game. 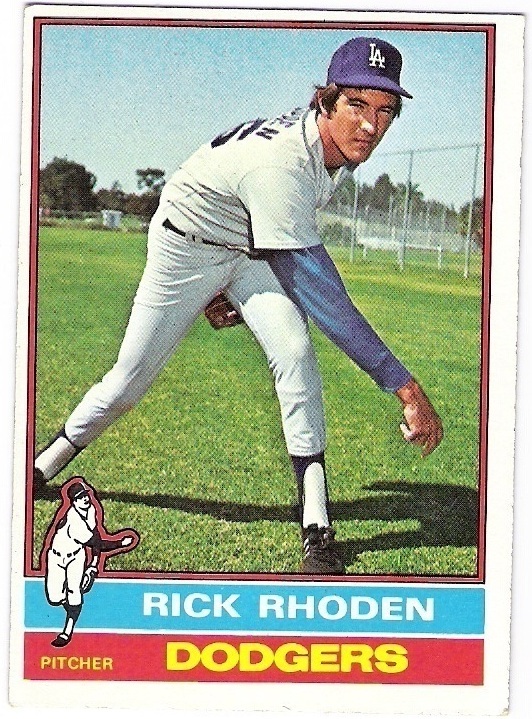 after allowing a single to mickey rivers, rhoden got carl yastrzemski to ground into a double play and then retired rod carew to end the inning. russell played pretty well, hitting .274 with 5 homers. 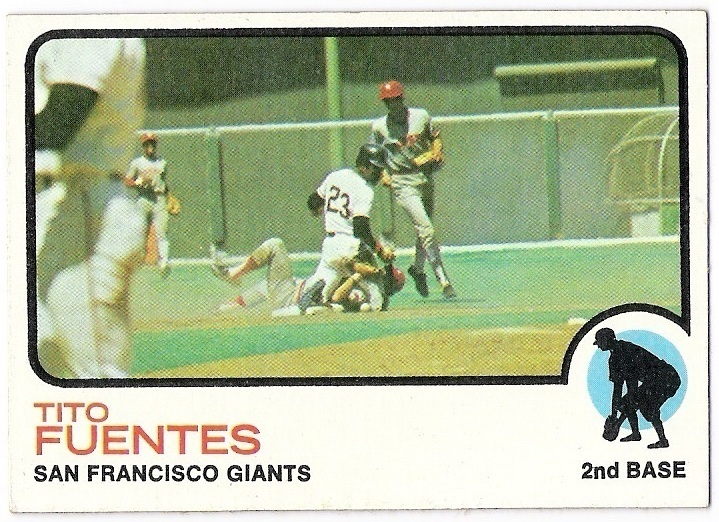 he made the all-star team for the second time in his career, and grounded into a double play in his only at bat. 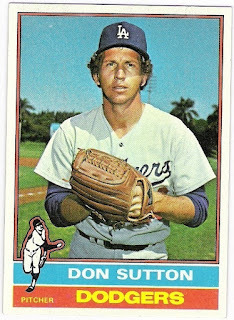 don sutton did not make the all-star team in 1976.
but he did win 20 games (21 to be exact) for the first and only time in his career. 20 of those wins came as a starter, and the other came in his only relief appearance of the season. 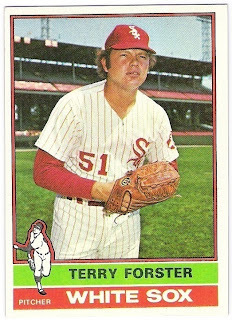 it looks like he was used in relief around the all-star break as a way to get him some work and avoid a longer layoff. 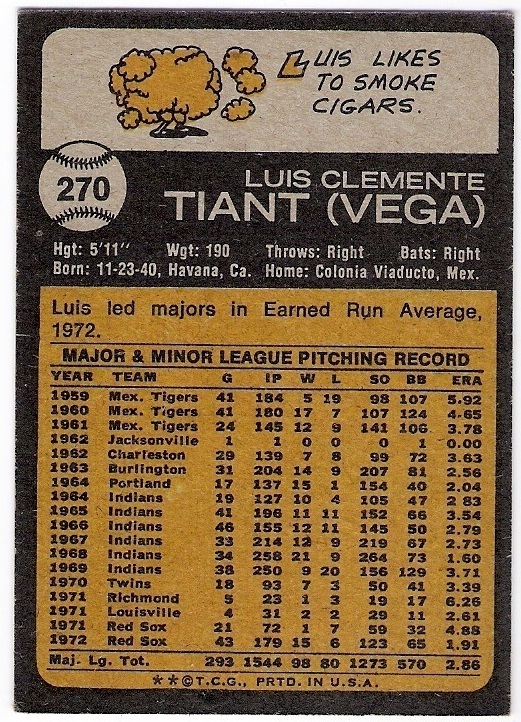 anyway, his 21-10 record, along with his 3.06 era, 15 complete games, 4 shutouts, a 2-hitter, and 161 strikeouts were good for a third place finish in the cy young voting. it was his fifth straight season in which he placed in the top 5 in the voting for the award. 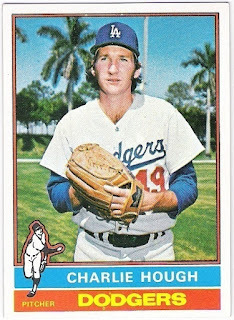 although he never won the cy young, he did win the lou gehrig award in 1976 for his sportsmanship on and off the field. 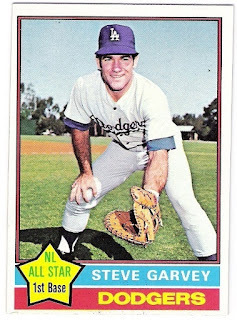 i guess in the clubhouse didn't count, or else steve garvey didn't get a vote. 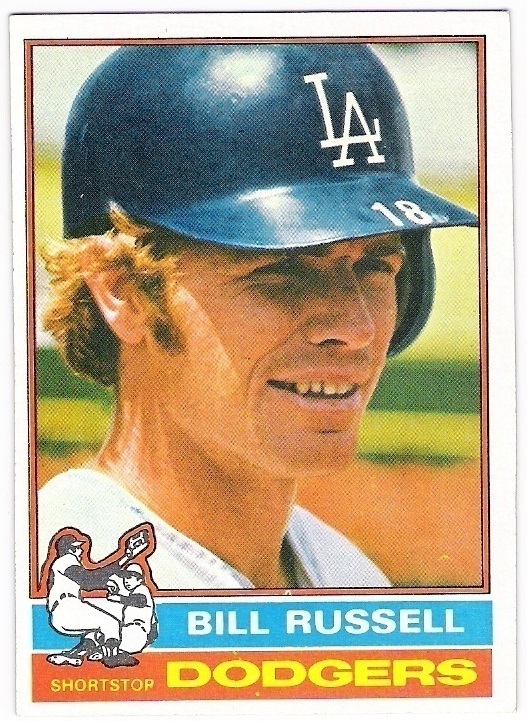 that injury, suffered in the on-deck circle, led yeager and dodger trainer bill buhler to come up with the catcher's throat protector. 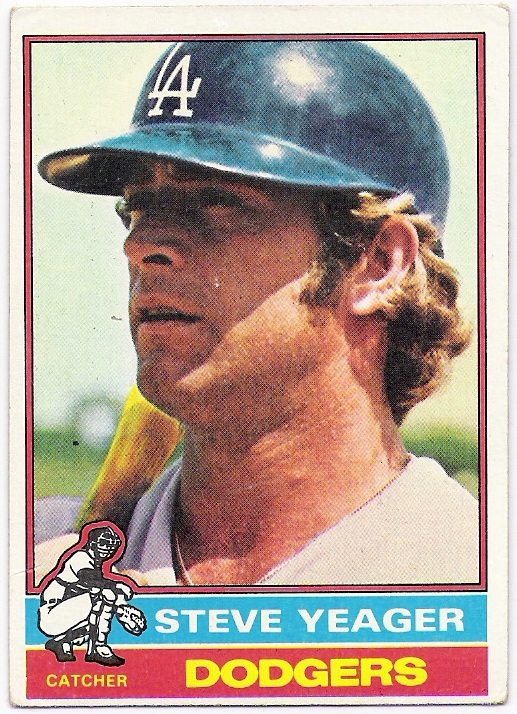 while he wasn't tinkering in the workshop, yeager was playing in 117 games behind the plate for the dodgers. 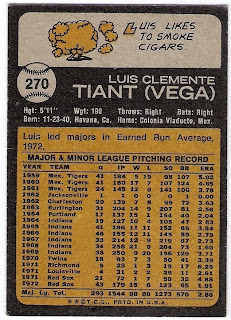 he hit 11 home runs on the year, but more importantly threw out 40% of the runners who tried to steal against him. when topps issued its 1976 set, there were still a few players who would become dodgers in the 1978 set who had yet to make the move to la. 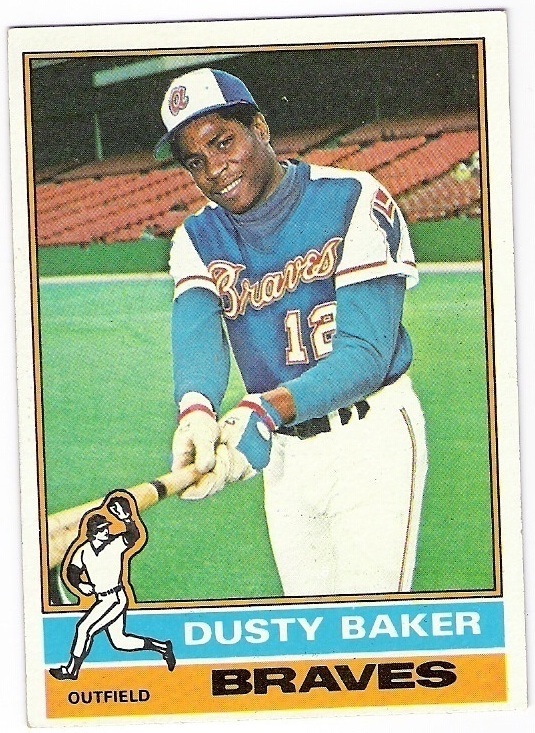 or, in one case, topps had yet to show that he had made it to the west coast, as was the case with dusty baker. 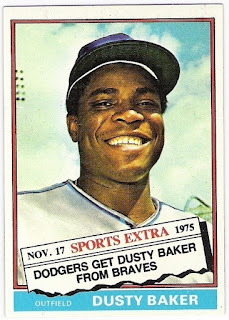 baker had been traded to the dodgers in november of 1975. a couple of the players involved in the trade (jim wynn, ed goodson, and tom paciorek) are featured in the set as members of their new teams, but dusty and future teammate lee lacy were not. his first season in la was statistically disappointing, as he hit just .252 in 112 games. 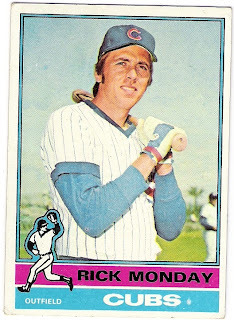 he missed some of july and most of september and wound up hitting only 4 home runs all year. two years removed from being one of the top relievers in the american league, forster actually started 16 of the 29 games in which he pitched for the chisox in '76. he finished with a 2-12 record and a 4.37 era with just one save on the year. 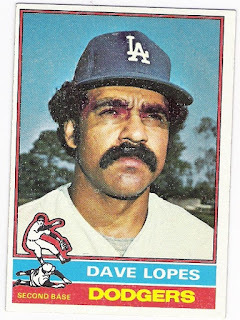 he was on the move after the season, but not to the dodgers. 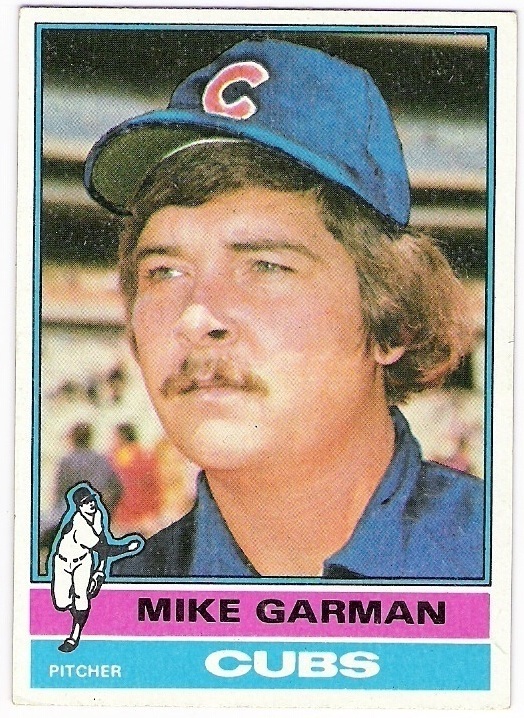 garman had been acquired by the cubbies in an october, 1975 trade. during his lone season with the cubs, garman went 2-4 with a save in 47 games. he also made the final two starts of his career. 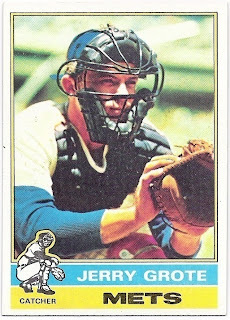 he played in 101 games, sharing time behind the plate with ron hodges and john stearns. 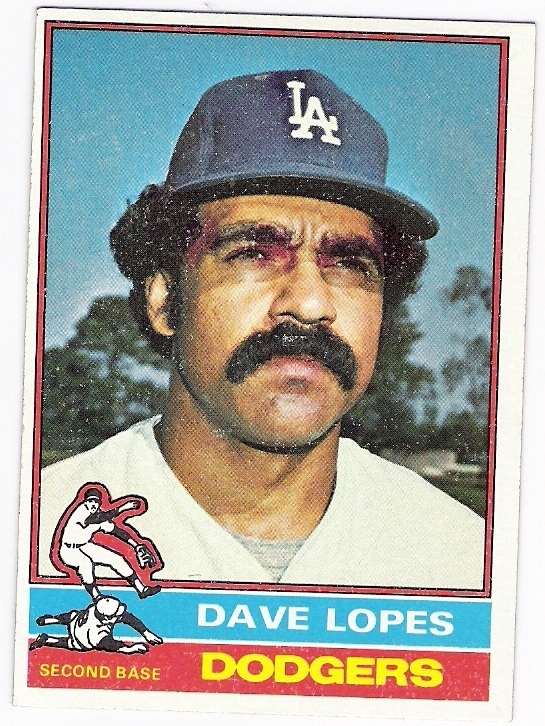 he hit .272 with 4 home runs and then contemplated retirement due to back issues. 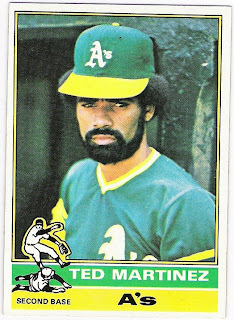 he was released by the a's in may of 1976 and signed with the reds shortly thereafter. 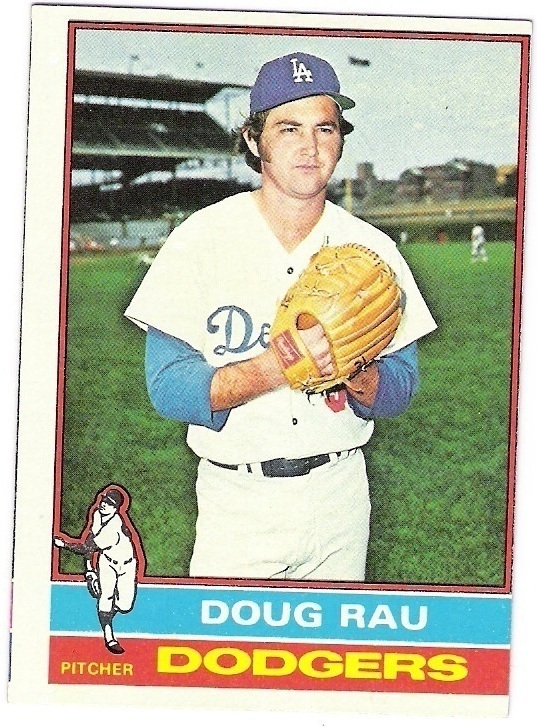 he spent the season with their aaa affiliate and was selected by the dodgers in the december, 1976 rule 5 draft. and his final year on the north side of chicago was pretty good. 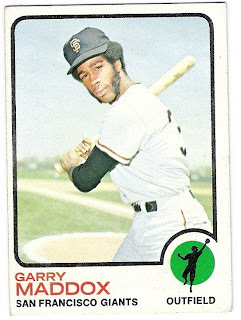 he set his career highs in runs (107), home runs (32) and rbi (77) while hitting .272 in 137 games. not bad power numbers for a guy hitting leadoff. 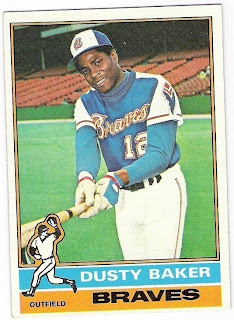 three times he hit two home runs in a game, including once against the dodgers (off of future teammates don sutton and charlie hough). 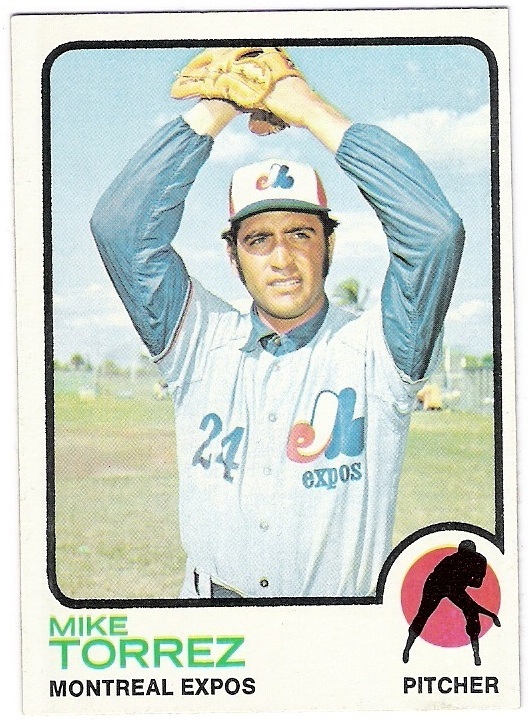 providing backup to bob boone and tim mccarver. 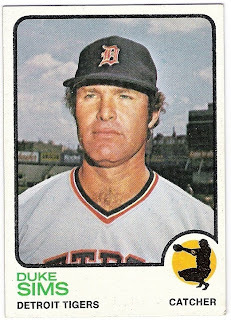 he made it into 37 games and hit .253. he made one appearance in the 1976 nlcs against the reds, and went 0 for 1. after the season, he was traded to the dodgers for ted sizemore. 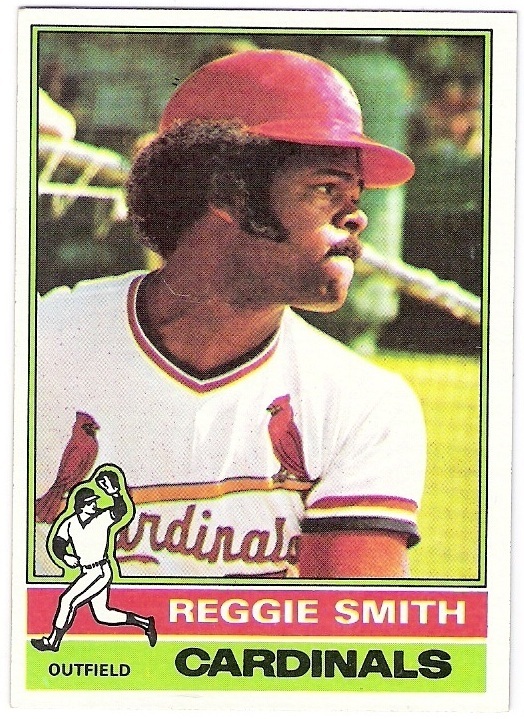 although smith hit three home runs in a game against the phillies in may, the cardinals traded smith after 47 games and a .218 average to the dodgers for joe ferguson. as a dodger, smith hit .280 with 10 home runs and secured the right field position and the three-hole in the batting order for himself. he started the year with the braves, going 4-4 with three saves in 21 appearances. 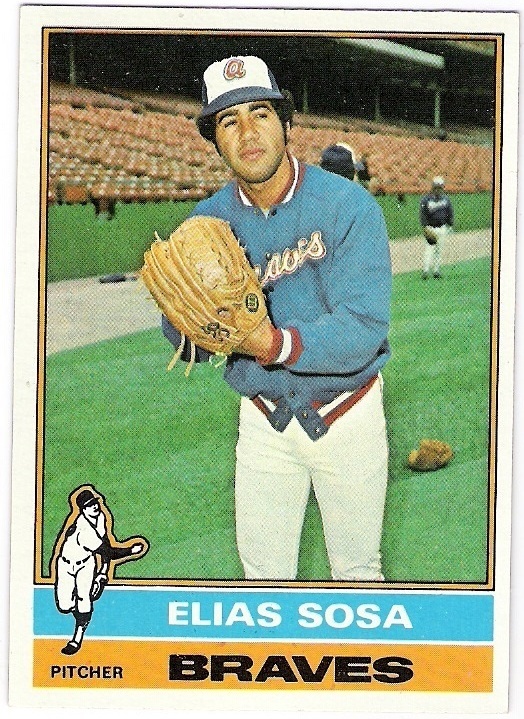 he was traded to the dodgers in june, and was 2-4 with a single save in 24 games for los angeles. he also lowered his era by a couple of runs. tomorrow we'll look at the guys who were in place, sort of, according to topps in 1976.
he also signed his 1982 topps card, his lone mainstream card as far as i am aware. lewallyn wasn't featured in the album, so that's why the inside cover is signed instead of a photo. 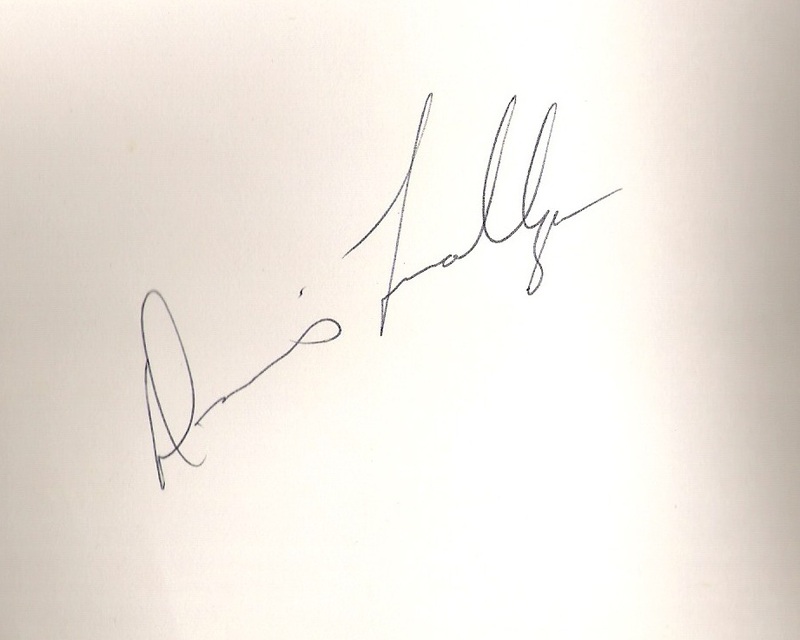 a nice group of autographs, likely signed 35 years apart. 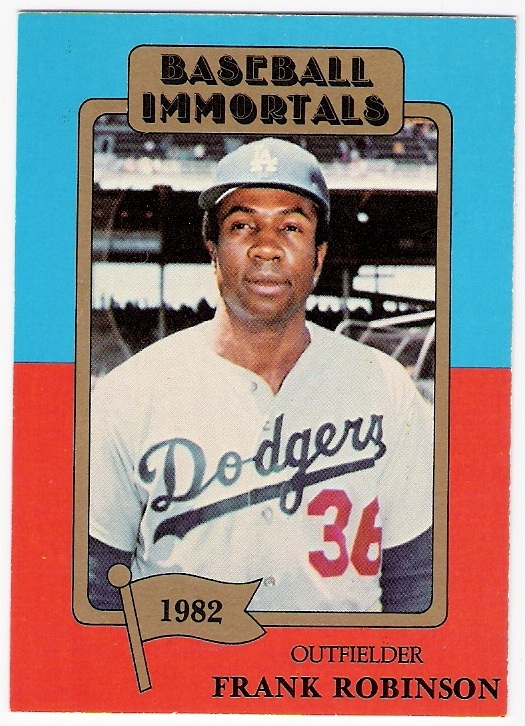 there was so much potential for frank robinson's 1973 topps card. 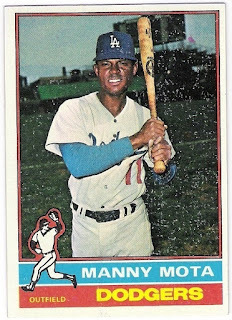 it would have been one of the first dodger cards to feature in-game action, and more importantly, would have been his only regular base topps card showing him as a member of the dodgers. as thankful as i am for the 1972 topps 'traded' card, i would have liked to have a good ol' regular base card with frobby's stats on the back. 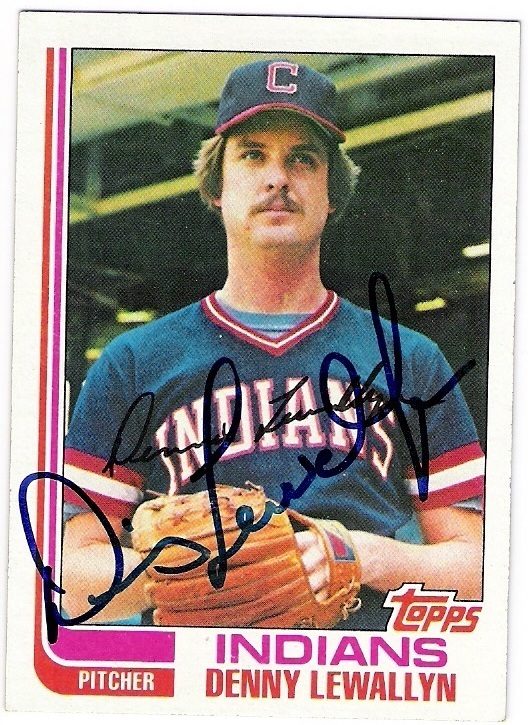 that's why i am annoyed with topps that they only airbrushed out 'dodgers' on his jersey. it would have been better had they found a head shot and airbrushed the heck out of it, like they did for bill singer. couldn't they have at least put the 'dodgers' script back on his chest? 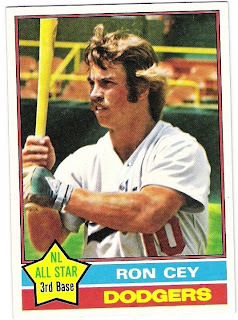 actually, using a picture of him in an angels uniform would have made more sense since the jersey piece is certified by topps to be from a uniform robinson wore during the 1973 season. who knew? 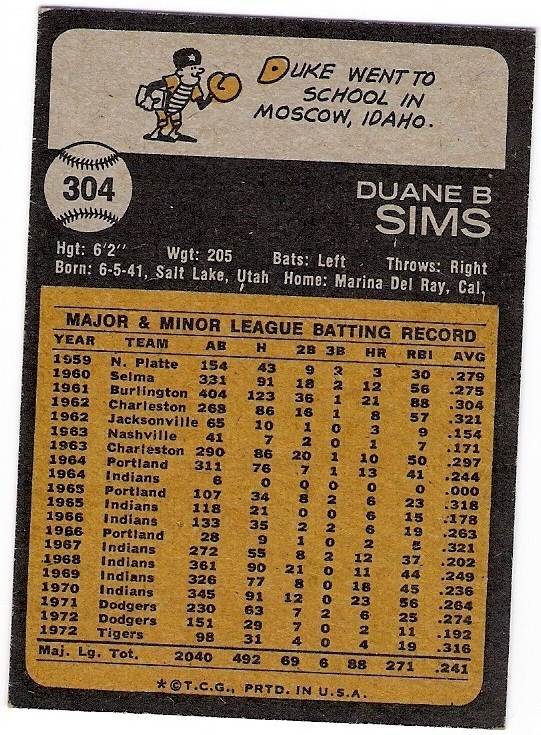 this card makes sense only if duke snider's card from the set shows him as a met, or if they would have shown steve carlton as a twin or giant had the set continued to be expanded into the 1990's. at any rate, it's nice to see 'dodgers' on frank robinson's shirt. 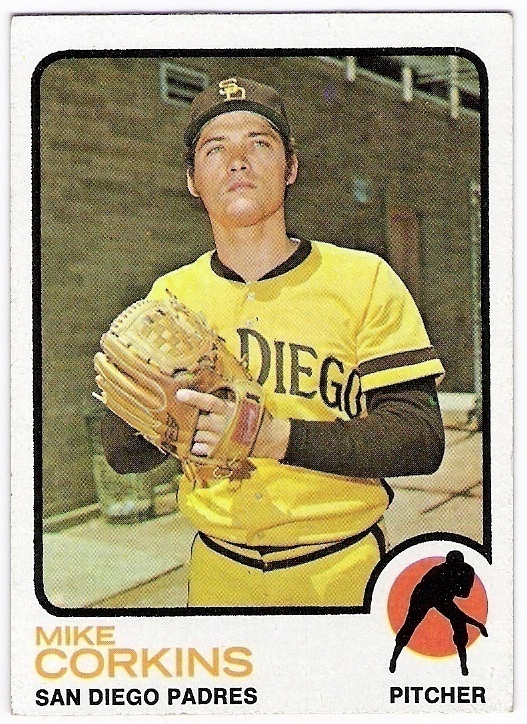 after facing the dodgers in the 1978 world series as a member of the yankees (he appeared in two games without an at bat), and splitting the 1979 season between new york and san diego, jay johnstone was signed by al campanis as a free agent. 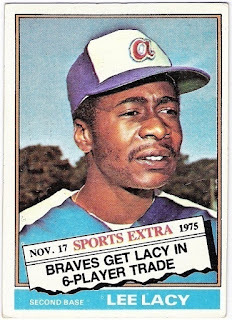 we were rewarded with a nice 1980 o-pee-chee team and text variation, and a year later got this run of the mill 1981 o-pee-chee card. 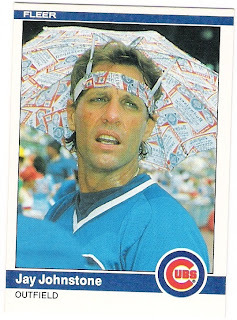 as a dodger, jay performed a bunch of pranks on teammates and manager tommy lasorda, but came through on the field when it counted. 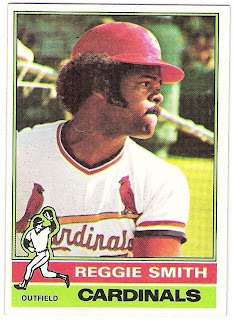 he hit .307 in 120 games in 1980, and after a lackluster showing in the 1981 regular season, he went 2 for 3 with a big two-run pinch-hit homer in the 1981 world series against the yankees. 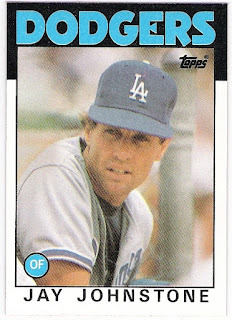 after an appearance on solid gold with teammates steve yeager, rick monday, and jerry reuss, johnstone returned to the dodgers for the 1982 season. a couple months in, however, he was released. 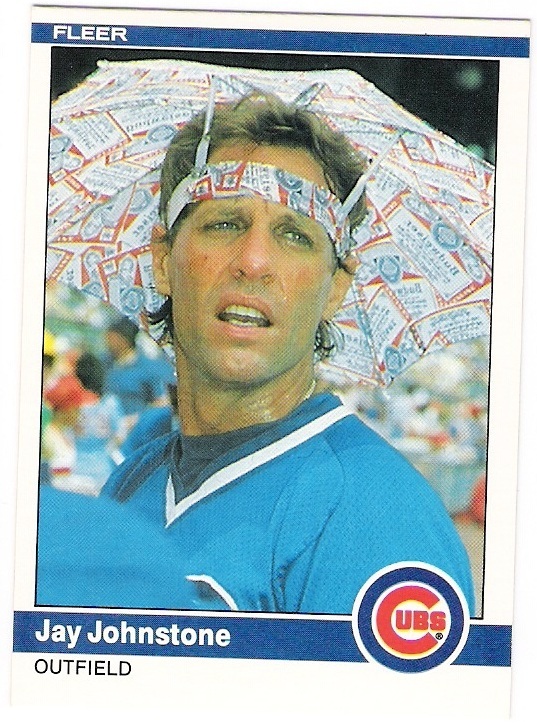 fortunately for fans of practical jokes everywhere, the cubs took a chance and signed johnstone to a contract. in his two-plus seasons as a cub, johnstone hit .257 in 236 games. 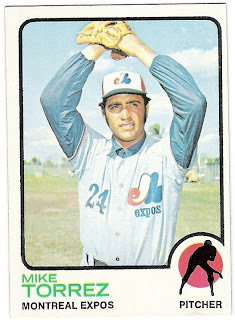 he also hit the final 16 home runs of his career, the last of which was a pinch-hit job off of hall of famer phil niekro. 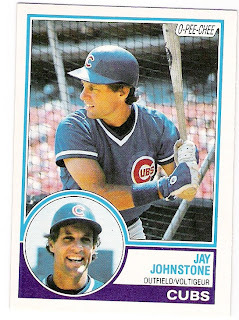 the cubs, who were making their run towards the playoffs, released johnstone in september and he failed to latch on with another team until the following winter. 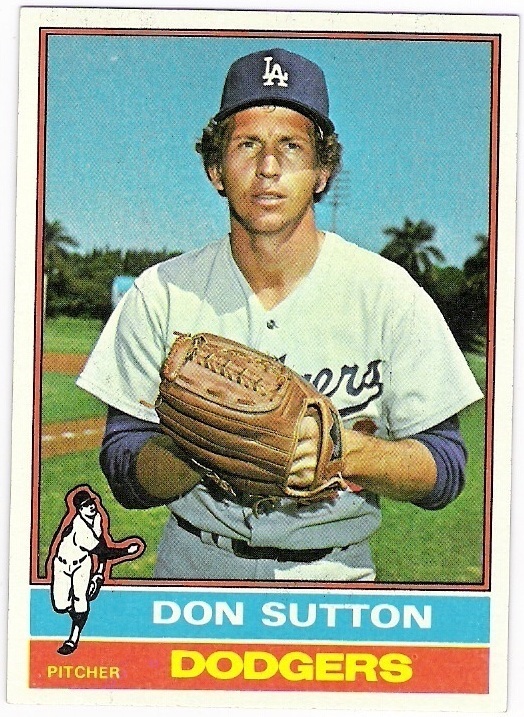 that's when the dodgers came calling again, and brought johnstone back, giving him dodger douple dipper status. here's to you, jay johnstone, another dodger double dipper! "only" twice in my lifetime have the dodgers won the last game of the baseball season. 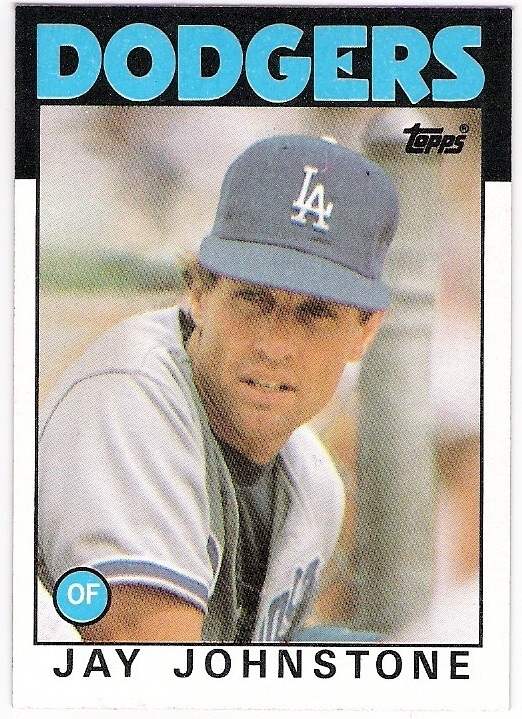 i was 10 in 1981, and 17 in 1988 - the last time the dodgers were in the world series. we are in the midst of the longest world series drought since the team moved to the west coast, and my baseball related christmas wish is that 2012 be a banner season for the dodgers. however, seeing the parts that ned has added recently, i think i will be happy with a new owner and a shot at 2013. "that's right. that's right. atta boy clarence." 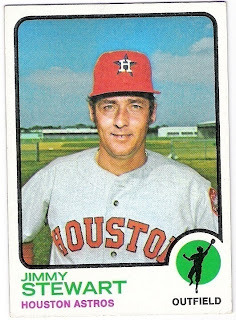 this 1973 topps jimmy stewart card came to me courtesy of reader and giant fan jim from northern california, who has sent me cards a few times. the last package came several months ago, and i am just now going to show off some of the bounty. the shame. 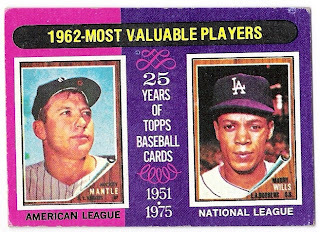 they were mostly cards i needed for my 1973 set. 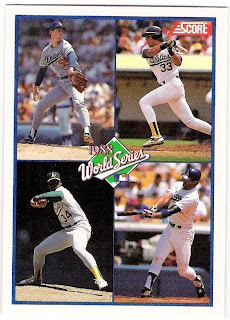 there are parts of 5 different players on the card, and although we can't see tito's headband, we are treated to a lot more thanks to topps' inability to crop their images. here's another giant, showing off a sign of the times - it's garry maddox and his muttonchop sideburns. plus, he can't be bothered to tuck in his jersey. his polyester pullover jersey. that was progress? who appears to be suiting up for the padres inside a maximum security prison. is this the first baseball card with a trash can featured on it? i wonder if cameron crowe saw this and came up with the idea for jeff spicoli's van. that's pretty crazy. 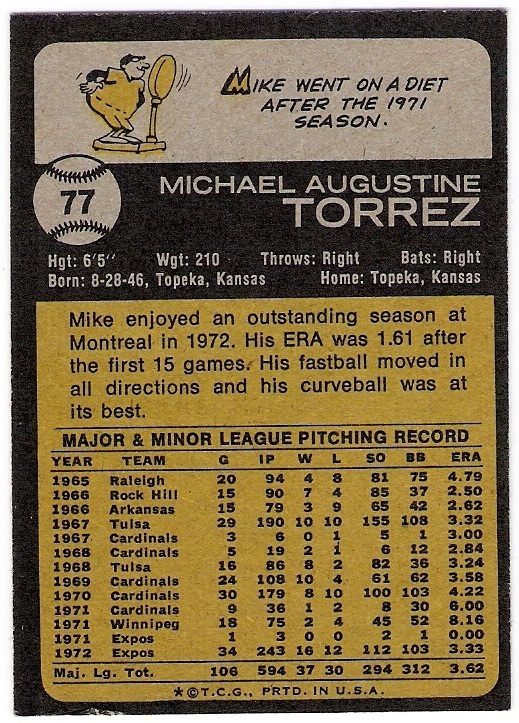 if only torrez sold insurance or cars or real estate in the offseason, then maybe topps would have had something better to say in the cartoon. thanks jim for the cards! click it - you will be rewarded! for trading, not clicking. i collect dodgers cards, any and all cards featuring steve garvey, ron cey, dave lopes or bill russell, all topps cards of the players who were featured in the 1978 topps set as dodgers, cards featuring dodger stadium, o-pee-chee variations, cards showing memorial patches and/or armbands, and cards showing the double play turn at second base. 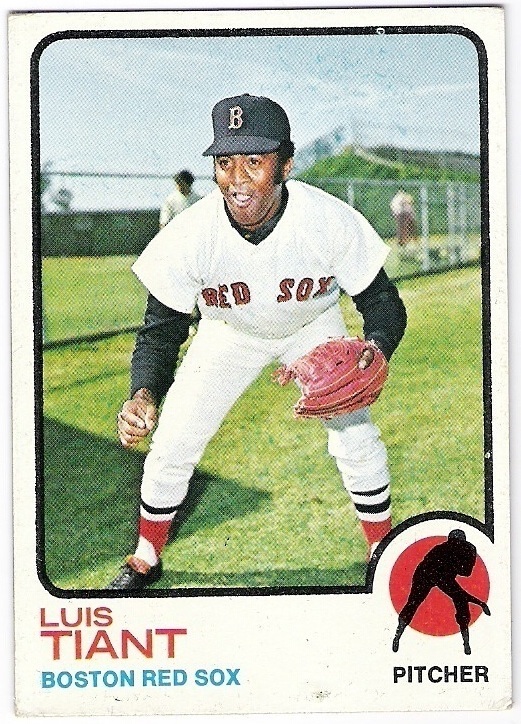 i am also currently working on my 1971 topps set. i have a lot of cards to trade! 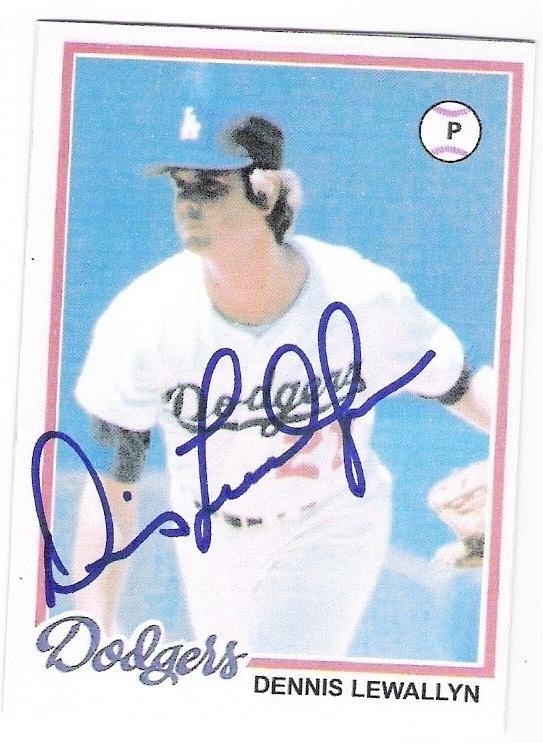 for richert, for the dodgers. twice. does anyone want and/or need this card?